Birthstrikers – cancelling their future kids to advertise climate change? Two hundred years from now anthropologists will marvel at a bizarre cult at the start of the third millennium that were so terrified of climate change that they vowed not to have children until the weather got perfect, or climate change “ended” or the Yeti appeared at their press conference. This is the logical end point of where the self-hate civilization gets us. In just two weeks, 140 people, mostly women in the UK, have declared their “decision not to bear children due to the severity of the ecological crisis”, says Pepino. “But we have also had people get in touch to say: ‘Thank you for speaking out about something that I didn’t feel I could even talk to my family about,’” she adds. Many of these BirthStrikers are involved with Extinction Rebellion, which on Saturday threw buckets of red paint outside Downing Street to symbolise “the death of our children” from climate change. So people involved with a group called “Extinction Rebellion” are rebelling against extinction by, wait for it, not having kids? The irony ‘s so hot it’s almost nuclear. Apparently they believe that if they went on a Birthstrike they could convince others to save the planet. I think the theory is that their friends would see this “sacrifice” and go buy solar panels, electric cars or grow hydroponic soy beans instead? Good luck, eh? Oh. It’s also a handy therapy group for people who don’t want to have kids … I hope someone finds some peace there. Seems pretty selfish to trade a future life for a political ad campaign. Hopeful? Dear Ms Pepino, You’re 33 and you hope that the world will change energy sources, decarbonize and then cool, in time for you to have a baby? Yes, but notice how little it takes to get a media story across the world if you are pushing the “right message”. 140 people sign something that no one checks, promising something that will cost them nothing, (which perhaps they were going to do anyway) and can be broken without penalty “by accident” any day and yet they get headlines everywhere. 185 comments to Birthstrikers – cancelling their future kids to advertise climate change? Don’t these fools realise that they are brainwashed and doing exactly what the UN Church of Climatology Cult wants – reducing the earth population and creating a pool of willing slaves? After all it is outlined in the UN Agenda 21 and 30 missives. There is an upside to it, the reduction of left wing ‘progressives’ in the future population mix. These woman should get recognition, an international award if you like, for their efforts to improve the human gene pool. Indeed why not go the whole hog and get themselves sterilized as the final solution !! And then afterwards go out and get themselves usefull jobs instead of throwing red paint all over the streets for others to clean up !! God these people are just so stupid !! God these people are just so stupid !! Indeed why not go the whole hog and get themselves sterilized as the final solution !! With any luck and a enough IQ points they’ll think ahead and remove themselves from the planet increasing their odds of success. Marxist dimwits like these are just spitting noise so they can look like heroes, no different to AOC. Next some media outlet will proudly lie that Climate Change™©® is causing reduced birthrates, if they haven’t already. Why should some innocent person have to provide jobs for these morons? I doubt they could do anything useful. Power: As evidence discredits global warming, resistance to such facts by green elites reveals their real aim is bringing socialism in through the back door. But don’t take our word for it. Listen to the climate change boss at the U.N.
Christiana Figueres, with the lumpy title of executive secretary of the United Nations Framework Convention on Climate Change (UNFCCC), came right out and said it: Democracy is a poor political system for fighting global warming. The really good model is communist China. China is “doing it right,” she told Bloomberg News Tuesday. “They actually want to breathe air they don’t have to look at,” she said with a straight face. Maybe that’s because for her information, China had breathed air it can see for decades under its command economy. Hot Air’s Ed Morrissey points out that on the same day Figueres was praising China’s top-down political system and denigrating democracies, China’s capital, Beijing, was engulfed in a massive smog cloud that prompted authorities to order children, the sick and the elderly to stay inside. Communist China has had one pollution crisis after another for decades. It’s also the home to black rivers, polluted groundwater, destroyed lakes and some of the world’s worst food standards — all fruits of a command economy where the public has no right to complain about anything because government knows best. 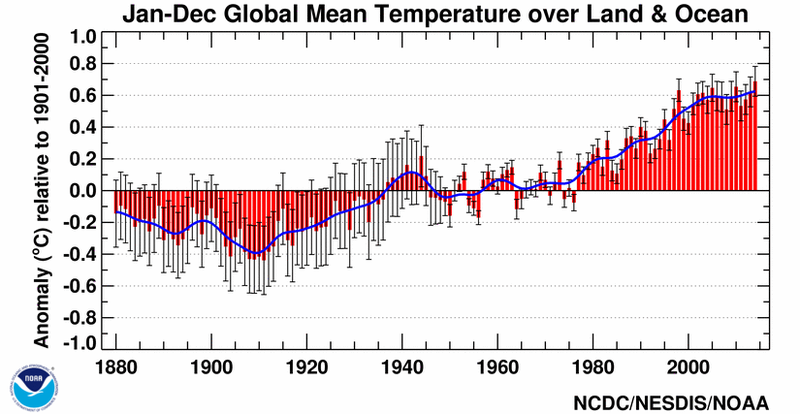 The only thing clear here is the real motive of global warm-mongers. They’re less interested in cleaning up the Earth than in controlling human beings in the name of “the common good” — just as the Bolsheviks once did, first in Russia, and then in China, where the tyranny continues to this day. He pointed out that as global warming falls apart as a theory, its proponents grow more strident because their claim to power grows ever more tenuous. But that’s of no concern to Ms. Figueres, princeling daughter of a former Costa Rican president who’s lived a life of privilege since birth and is now badmouthing democracy and praising communist systems. She condemned as “very detrimental” Congress’ refusal to pass the U.N.’s climate change agenda even as evidence reveals global warming as a hoax and the U.N. agenda as a threat to America’s economic well-being. In the world she inhabits, the people’s interests don’t matter — neither in the United States nor in pollution-choked China. All that matters is control, her control. In modern times, the only ecosystem in which such people can effectively exist is a communist one. Some states, like Florida, are particularly attractive to residents fleeing high taxes because the state does not impose an income tax on its residents. Even Rep. Alexandria Ocasio-Cortez’s (D-NY) mother, Blanca, boasted about fleeing New York to live in Florida to take advantage of the state’s lower taxes. Yes, I’ve read about all the things you mention. They’re perfectly true. And my understanding is that Prince Charles was up to his ‘royal derriere’ in the organisation of that 1992 Summit as well – entertaining around 190 national representatives on the royal yacht ‘Britannia’ that same year, off the coast of Brazil. The representatives signed a MOU which has guided policies in their respective countries ever since. And none of us ever got the chance to vote for any of it. Ever since then, Prince Charles has been spouting environmental nonsense and making dire predictions of climate Armageddon at regular intervals. And his father, the Duke of Edinburgh, has expressed a desire to be reincarnated as a deadly virus in order to wipe out most of humanity – in keeping with Jacques Cousteau’s insistence that most of us simply have to be eliminated. It makes me wonder just how many of Britain’s Royal family are in agreement that at least 90% of the human race will have to go – although they probably haven’t put themselves on that extermination list. And if the British royals are heavily involved in this, at what political level does full knowledge of this terrible agenda begin? Ministerial level? Prime Ministerial level? So-called ‘Climate Change’, as I see it, is simply an extremely useful tool seized upon by a certain class of people to bring about societal changes on a scale so vast as to be all but invisible to most of us. And no one would believe it, even if it was pointed out to them. Australia’s LNP Coalition has failed to differentiate itself in any meaningful way from the Australian Communist (Labor) Party when it comes to Climate – the most critical policy of all. Do we ever ask ourselves why? At the highest level, could it be the LNP and the ACP are in fact the same party? And do we get what we’re given, no matter who we vote for? Notice that Maurice Strong only wanted to eliminate the “affluent middle class”, not the wealthy upper class, nor the poor lower class. Clearly, Strong believed the wealthy should end up ruling the world, with the poor lower class being their vassals and slaves. The middle class were to be either eliminated or turned into poor lower class. B*stardry and dictatorship writ large. And it’s out there for all to see – if only they bothered to look! If only the Birthstrikers parents were Birthstrikers, the planet would be saved by now, and weather would be just fine. Where can I donate to their cause? This is the perfect antidote to being overrun by these fools, or at least their descendents and their stupid ideology. Can we nominate them for the Darwin Awards? It’s kind of an odd twist to the Darwin Awards. In this case, natural selection at work. As a man, I refuse to have any children with them until they come to their senses or my vasectomy wears off, whichever occurs first..
Gotta be a swag of PhDs in this for the population biologists. Superstition/imagination as a built-in population-limiting behaviour. They poor red paint in front of Downing Street to protest climate change and the environment – Really?? The idiots didn’t consider how much damage that paint will do in the London sewers? But they will save the world by 140 of them not having babies – guess what? – with 7.7 billion in the world and 225,000 added EVERY DAY I can really see how devastating this campaign will be, no wonder the Poms can’t get Brexit right with brains like that polluting UK society!! I thought that was all part of the plan. Enjoy your [multiple] “5 minutes of hate”@ 6:00 pm EVERY DAY! or stream it continuously on your iSpy Fondle Slab BUT never, never, never engage with the person at the bus shelter! You’re not seriously suggesting that people engage with reality , are you? The “Fondle Slab”reference came from James Corbett. Mind you, if they are dim enough to deny a fundamental role of their womanhood in their lives, perhaps we are better off if they dont have kids that might ( and here is the irony ) do the same later….. Note that the data for this world ending(tm) nonsense only goes back to 1981….. When the “panic” about “market failure” is bandied about, is the concept of rent seeking surfacing in a new industry? “But the insurance industry is already on the brink of “dangerous market failure”, according to Karl Mallon, director of science and systems at climate analytics company Climate Risk. “If the industry doesn’t step up, we’ll all pay — both as taxpayers picking up the bill for the recovery … or because of the impact on our communities and our economies,” says Dr Mallon. “The Actuaries Climate Index tracks changes in the frequency and duration of high temperatures, low temperatures, heavy rain, drought, strong wind and changes in sea level. Saving the planet–but for whom? If we want a sane world, then all who want to be part of it need to accept a few things. Mutual obligations exist. Contribute a fair days work, or go hungry. Show restraint, or be restrained. Show respect for neighbours or be isolated. Manage politicians, or be enslaved by them. Gain education, but not at the expense of losing contact with reality. The end of climate change? That’s made my day! Many of them will end up having kids regardless. Two things have changed in the last 60 years. The excuses and the methods. 60 years ago the excuse was The Bomb. The goal hasn’t changed. That’s avoiding the work and responsibility of bringing up kids. When comes the time for aged care, send these recalcitrants to the back of the queue. Meantime, the biggest inhibiting factor on our fertility rate has been the fear of divorce. Which, as pattoh pointed out, is in the Marxist plan. Jo, sorry but this is a nonsense publicity stirring story from a bunch of very dopey extremists. Why give them more oxygen and publicity ? Yeah, I tend to agree, monsoon is mucking up. Has it been a full moon recently? A relative who is a plod recently mentioned the full moon seems to bring out the crazies…. Lunacy is a contentious issue. Their models see a cyclone developing, either in the Gulf or on the otherside of Cape York. Yeah the MSM is already beating up a cyclone warning for Far N Qld based on an area south of Moresby and east of the Cape. There is heavy cloud there but it’s not organised, no rotation, 19kph wind gusting to 35kph, pressure 1011hPa. In other words ZIP. The BOM’s Meteye cyclone forecaster is showing nothing either. There is even less happening in the Gulf. Their crystal ball is in overdrive and looking well ahead I think. There is however an interesting rotational system WSW of Jakarta which might develop and make it to WA if it can dodge across the massive high to the south of it and drift east. It’s a very long draw of the bow though. It can just as easily disappear as they have been doing lately. How any of that meshes in with the monsoon front, I have zero idea. OriginalSteve. A looong time ago there was a study that tried to disprove lunar influences but ended up showing the reverse. There were higher rates of hospital admissions at full moons (can’t remember if it was due to internal factors or the result of brawls). It was also found that there were changes in blood chemistry such that haemorrhage was more common. I think it was in the 70s. Oh my Godddd! It’s CAT.5 already!! BoM will upgrade further if wind exceeds 100kph. See ya don’t need cyclogenesis as such. Anyway I’m hoping it makes landfall near Mackay as a beaut rainfall bearing system that makes its way down into Northern NSW. Great expectations will probably dashed as system recurves if a trough interacts. There won’t be a cyclone on the east coast of Australia because of the mild south easterly breeze. About the lunacy. City lights hide it, but outdoors away from the city lights on a moonlight night is a fantastic world. Those who have never experienced it don’t know what they are missing. I find new moon brings out the most crazies and the worst driver behaviour on the road. If you consider that this is when the moon and sun are in alignment, and they have the most “tidal” influence on our planet and on our bodies which are predominantly water (and a few billion bacteria), if they’re going to have an influence, it will be stronger when the moon and sun are aligned. Let me see here. If you go on strike it’s supposed to be a threat of loss or harm of some kind to someone. If teachers strike, no school for the kids until the strike ends. If workers strike, no work and lost money for the boss until the strike ends. The strikers want leverage to help them gain something they want. At least I think it’s supposed to work that way or did I miss something along the way? So who is going to have any any loss or harm from these birthstrikers? Only the strikers. How do they gain any leverage that will help them force an end to climate change? I say let them strike and ignore them. If they wake up and realize it’s hurting them they have the power to stop the strike unilaterally. Any way you stack this there will still be plenty of children born so depopulation isn’t even a threat. I must be dreaming this. If not it’s better than the best joke Johnny Carson ever told. Quick, someone tell AOC. She’ll want to join this immediately. And that ends the threat of any little AOCs running around in the future. So Darwinian selection at work, weeding out the fragile, the weak minded, the non competitive, the unsustainables, the fearful, the timid, the lazy. As always. Of course there are also a lot of people do not have children because they do not want the enormous expense, the sheer trouble and the endless sacrifices but now we have a new class of people who do exactly the same because they have a higher sense of moral obligation than others who selfishly and thoughtlessly have a family. Imagine how much easier their lives will be, the holidays, the new cars, the careers without being encumbered by looking after anyone else. That’s not why they do it of course. They are trying to save the planet. For whom exactly? The things lacking are plausibility and credibility. Windmills work the same way. Useless great things which do nothing to reduce CO2. After all the world now has half a million of the things and CO2 levels are completely unaffected, which was the entire point of building them. It’s not a worry really. They will all be broken within twenty years, as much use as Easter Island statues and with as much justification. However it works out as Darwinian selection either way. Dead end genes. I suspect the easter island statues dont shred birds and will definately outlast the ( allegedly ) CO2-preventing windmills…. My thought too, Darwinian Selection at work here. future oblivion. Down the memory hole with them. I think that we are all carriers of this gene, so its survival is guaranteed. Certainly , non – breeders will do nothing to proliferate the gene. I think we have to look to epigenetics to find out what it is in the environment that has triggered this response e.g. overcrowding or other societal pressure. I blame it on too much dependence on the lying media and the make-believe world they want us to emulate. Perspective is always necessary and the fact that you say there are now half a million of them gives that. That many, surely is a valid experiment and we still have “the weather” harassing us just as it’s done for the last 8,000 years. Time to Stop These Things, but more importantly demand, design and build a Functional Democratic Model that serves all of us. The one we have is Totally Stuffed. Or grandiose virtue signalling when in fact it represents selfishness, not virtue. Think of all the previous generations often in desperate brutal conditions whose survival against the odds and fight to bring up families safely brought them to a safe place where they could say it would end because it might be a tiny bit hotter? Luxury living. Why don’t they take this movement to its logical conclusion and off themselves now rather than spend the rest of their pathetic lives consuming resources that the productive people have more use for? They don’t just consume resources. They deliberately impede the production of new resources. As some posters have indicated this is a good thing. The process of natural selection will mean these fools will become extinct albeit not soon enough. I say go ahead make my day. Stop having children because if they did have children I would feel very sad for the kids growing up with stupid people like them. We will be far better off without such empty headed people. Western Civilisation will become extinct in due course. Science, reality and common sense have already all-but died an un-natural death. For those who have not seen Hans Rosling you may be surprised that the number of children across the globe reached its long term peak in 2000. It will rise a little in coming decades but is forecast to settle at the level reached in 2000 by 2100. By far the most effective birth control is eduction of young females. Birthstrike is arguably evidence of that but also shows what effective propaganda can achieve. I see in this as well as the children school strikers not so much a lack of intelligence as failure of society to value truth and expose lies. In my opinion both groups are evidence of abuse and misleading propaganda. In that analysis I see myself somewhat accountable for these poor folks’ consternation in that I and others with similar knowledge have allowed the misinformation to propagate. My efforts to bring light to this subject are too puny and I must do better. Thanks to those like Jo and Anthony that struggle against the lies by making truth available. The propaganda has become so powerful that I am shut out of even my local letter to the editor option and am by and large left only oral communication for my efforts. OT , sea level rises in QLD over 100% and we’re all doomed going by this . Just curious, I wonder how they identify and address outliers? Most of those graphs show very little (and probably insignificant)change of about 1 sd or less. Some of the ones that show larger changes appear to be affected by one or two extreme events (I hate that term)that could be interpreted as outliers and at least should be addessed. Back in the late ’70s when I was an impressionable, young, high-school student, our class had to watch a documentary about pollution in the Mediterranean Sea… put me off ever going there (although ten years later in Alexandria, Egypt I did jump in for a bodysurf after an all-day 40˚C desert bus ride). Looking back, methinks the doco may have been a UN-something population production, as all my family and friends have gone forth and multiplied except me (not for lack of trying, I must add). OT but an intriguing blast of COLD sea water, anomaly of 4˚C to 6˚C cooler, squirting through the Panama Canal from the Atlantic into the Pacific, all the way out to the Galapagos Islands. Any hydrological suggestions? Its probably natural, I’ll take a closer look. In the meantime, Tasmania is exhibiting a regional cooling signal. Re: the Panama Canal – the boats are lifted up to Gatun Lake from both the Pacific and Atlantic sides. What you are seeing is an upwelling. I don’t recall seeing that anomaly before….. some gate. Greg there are locks in the Panama canal.. I think the canal rises about 120 meters via those locks. and pases through a fresh water lake as well. So there is no direct sea water connection between the Atlantic and Pacific oceans. Thanks Bill and el gordo – yeah those elevated locks, fed by the inland lake, result in only freshwater heading down to both coasts, while a similar yet colder upwelling happened in the same spot in 1985 and headed SW to the Galapagos too, so it’s not (to use the jargon) unprecedented – phew! I can sleep easy now. I’ve noticed warm upwellings over the years drifting out of the Gulf of Panama, yet this is the first cold one I’ve seen. Always wondered if some big kahuna submarine volcanoes were hubbling and bubbling away under the calm azure sea [more research needed on deep ocean currents?]. And while NIWA et al. drone on about warm Tasman SSTs, they never mention the opposite on the other side of the Pacific. Balanced communication? Who needs that – just believe. Climate change is cyclic and long lived, wheels within wheels, whereas a two decade plateau in temperatures proves we lack a trend. Its been as flat as a tack. If you squint your eyes the hiatus is plain to see. DENIAL is something pfitz swims in. Its akin to a sewer because of that. There is ZERO EMPIRICAL EVIDENCE of any human caused warming. … so it can be ripped apart, as usual. Actually , 33 of the last 40 years have been part of zero trends. You have yet to present any empirical evidence that humans or human released CO2 has any affect on the climate whatsoever. …. why, the Reserve Bank, its members, and the insurance companies, of course. Its a PLOY, a SCAM…. and many people are starting to realise that. Banksters and luvvie journalists now agree on the need to operate a market in a fraction of thin air while parking yet more debt in money/energy/resource-gobbling white elephants. No wonder a Grauniad reader is a bankster’s favourite vegetable. The Reserve bank is hopeless at economic predictions. Dr Lowe … acknowledged the RBA was not very good at predicted future house price moves. They will be just as bad at future climate predictions. They are gullible fools, chasing a mindless fad. More than a bit like you. Now, maybe if your mother had been one of them !! It’s dopey ABC bit of fluff. So it gets a red thumb from me. The messenger is the propaganda wing of the Klimatariat. Messenger needs to be shot, for delivering idiotic anti-science pap. DENIAL, that is what POC swims in. !! Do you have any empirical evidence that human CO2 has any affect whatsoever on climate yet, little trollette? Halfwits connected to the fossil fuel powered grid and drive fossil fuel powered cars do not breed more halfwits..
As a way of fighting the use of fossil fuels..
Who will decide when climate change has ended and the weather is perfect so these people can have kids? And if the weather is perfect in their part of the world, will it also be perfect in other parts of the world at the same time? 97% of climate scientists do not want climate change to end. Climate change is as certain as death and taxes. There is no end to it. It has evolved into the ultimate wealth transfer through government largesse. It begets big government and is self-sustaining. Believers are rewarded while deniers are crucified. And when they get into their forties, these women will be desperately looking to IVF when they realise it’s finally too late to have that child they always longed for. You know, someone to look after them in their old age. Sudanese women ‘man up’ because of climate change. So we can strike for everything and anything these days? The in-answered question is just how many of these 140 women were actually in a realistic position to start a family? Do we even have proof that all 140 honestly identified as straight? What is next? Drive-Striking? Refusing to use a motorvehicle until the government agree to return your driver’s license? Also 140? Seriously? Note the fine print; “Mostly women in the UK…” So this is 140 out of the entire population of the UK AND elsewhere. (also I just realised “Mostly women…” so many some of these people are men…) Female population of the UK alone is apparently 33 million. If we are generous and assume 2/3rds of that are either too old or too young then we are still left with less than 140 out of about 11 million. So roughly 10 parts per million, or about 1 per 100,000. Why did I just go ‘per 100,000′? So I can compare it to the England and Wales murder rate of 1.22 per 100,000. Yes, more people are committing murder than support this joke of a political statement. Muse on that one. Well done Mudcrab for putting this into its proper place on our Worry List. Rarer than CO2 molecules then? YEs, but notice how little it takes to get a media story across the world if you are pushing the “right message”. 140 people sign something that no one checks, promising something that will cost them nothing, and can be broken without penalty “by accident” and they get headlines everywhere. After looking through the Birthstrike web page, and considering how wonderful it would be to be married to one of these girls; I’d say they’re likely to be successful (accidently or otherwise). There’s some irony in this. The person who e-mailed it to me is a True Believer. She spilled a little in her lap, and was promptly awarded a huge settlement. Thank you Jo, what a laugh! Throughout human history most children would die before reaching their teens, with average life expectancy about 30. A child born today in the developed world has a life expectancy of over 80 due in large part to the availability of cheap energy. as with most things connected to XR, BBC is the source. Video has EXCLUSIVE at top of screen. two interviewees, Blythe and Alice Brown; at the end, Blythe mentions Victoria’s previous segment, apparently about individuals doing their bit for CAGW. 4 Mar: Facebook: Extinction Rebellion: Coming up this morning in the BBC Victoria Derbyshire Show. BirthStrike: Brits decide to not have children due to fear of climate and ecological breakdown. Is it still eugenics if the target participates willingly? No doubt in an earlier age when the authorities removed the head from Ned Kelly’s corpse in order to examine it to determine a way to predict the behaviour of bush rangers, there were people so stupid and ignorant that they expected this to be possible. Unfortunately, we have not be come smarter since that time. Belief in the idiotic superstitions of “climate change” require even less intelligence. Subscribing to a Leftist ideology represents a cognitive defect dealing with information processing. Removing these defective genes from the gene pool can only be a good thing. PIC: School students at a climate change protest, in Brussels, on February 21, 2019. It is ironic that a generation known for its self-absorption can see the signs that adults with the actual memory of less extreme weather fail to discern…Children have taken the lead, it is time adults followed. Birthstrike – what is the point? Editor’s Note: This paper is part of a series from the Cross-Brookings Initiative on Energy and Climate (LINK). The paper’s executive summary follows. View the full series here (LINK). Despite RE’s visibility and ascent, cleaning up coal, including through more efficient plants, is a more realistic goal than wishing it away. One very young US Socialist Democrat has commented that she would not like to give birth to twins and be pregnant for eighteen months. I hope to find a time to use that. Good news indeed and an interesting and unexpected demonstration of Darwin’s theory of the survival of the fittest! If only all of the climate alarmist could be so persuaded……. to dream is to hope. Their numbers will, no doubt, soon be enhanced by [Snip 18c "a religion of peace"]! Less mirthy was news from the CEDA conference yesterday, where it was noted that car manufacturers are phasing out internal combustion engines for electric by 2025. So at a time when we are ramping up the price of electricity in leaps of 100% per annum we are about to force everyone to connect to the grid at the time of peak demand in the evening! Make the population depended on electrons and use the access to it to control them!! The longer term agenda after ICEV are no longer sold will be public transport only for citizens of no rank, local area transport only without a permit to travel beyond your home district. As well, in Victoria at least, a few weeks ago, during a heat wave, the system couldn’t cope and we had blackouts. Going to all electric vehicles will mean, if there is no electicity, cars cannot be charged, so not only will people have no cooling, fridge, light, cooking (if they have all electric appliances), they probably won’t be able to go anywhere. Depends to what extent trains, trams and electric buses are affected by blackouts. I think this is a great idea – encourage all greenies and cultural marxists to immediately sign up. We can be rid of all of them in one generation!!!! Mother, what did you do in the Climate wars ? Your red thumbs are for supporting virtue signalling imbeciles, not for posting a link. No, you were NOT thinking. You were trolling, and childishly seeking attention. What a LONELY pathetic life you must lead.. by your own choice. Do you need a tissue, or a nappy change, pfutz ? It was your pointless comment about these 140 gullible little child-mind actually having any point to there FAD based SJW comments that earned the red thumbs. You comment, as always, had NO POINT. The president shared global warming skeptic Patrick Moore’s theories with his more than 58 million followers. President Donald Trump on Tuesday once again used his Twitter platform to share misinformation about climate change to his 59 million followers, quoting a “Fox & Friends” guest who falsely claimed global warming isn’t caused by man and could actually benefit many people. Former Greenpeace Canada President Patrick Moore, a longtime nuclear energy industry shill, denied that human activity fuels climate change and claimed the phenomenon doesn’t pose an imminent danger to life on earth, despite the mountains of scientific evidence that suggest otherwise. Also being considered for a spot on the White House panel is retired MIT professor Richard Lindzen. Lindzen is both on CO2 Coalition’s board of directors and a distinguished senior fellow at the Cato Institute, a libertarian think tank based in Washington, D.C., that is funded by the fossil-fuel billionaire Koch brothers. Moore took the opportunity during his Fox & Friends interview Tuesday to give a plug for the CO2 Coalition. “We believe that carbon dioxide is entirely beneficial to both the environment, to agriculture and forestry and to the climate of the earth,” he said, urging viewers to visit the group’s website. Watch Moore’s appearance on “Fox & Friends” below around the 26:50 mark. I saw this at Delingpole’s site pat – how utterly appalling, and how clumsy is the attempt to airbrush Moore from the history of Greenpeace! I looked at the historical Greenpeace website and then at its current history – much the same except Moore has been removed from the committee and is now just listed as a crew member. Do they not know that nothing ever disappears from the internet? You know they are losing the argument when they need to rewrite history – rather like ACORN-2. Another indication that the AGW/MMCC myth is nearing its end. Also I see that the Leftist Snopes fact checker is parroting the new Greenpeace mythical history to say that Moore and Trump are lying when both claim that Moore was a Greenpeace co-founder. Advance Australia has raised almost $400,000 it will use to shore up the positions of key Liberal Party conservatives ahead of the federal election – including that of former prime minister Tony Abbott. The emerging grassroots organisation, which wants to be the conservative answer to left-wing activist group GetUp!, claims 27,500 members and a $395,000 war chest raised from 2000 “mainly small donations”. It will focus on the seats of Dickson, Deakin, Boothby and Warringah, held respectively by Peter Dutton, Michael Sukkar, Nicolle Flint and Mr Abbott. A China built and funded Hele would save Abbott. If its discovered that Morrison lacks a backbone then Abbott will return as leader after the election, with Barnaby head of the Nats. In Opposition they would be formidable. Wind turbines, solar farms and the renewable agenda will only impoverish society.. The whole AGW agenda, and indeed most leftist ideals, will always lead to a base-level REGRESSION of society. What is this obsession with the calendar held by the loonie left? “Yesterday’s men with yesterday’s solutions.” Young Peter Fitzroy speaking to his maths teacher about Euclid and Newton. Not sure if all the money in China could save Abbott but one thing is almost certain. If we can’t turn things around and save Australia from the socialists in both major parties then China will do it for us. Funny how China is a communist nation yet they would happily build both coal and nuclear power stations here by the dozens if necessary if they were in control given the large reserves of coal and Uranium that we have at our disposal. Weather experts across the country say Montanans just endured one of the coldest winters on record, with some of the most extreme weather seen in the continental U.S. in modern history. Cold temperatures and heavy snow that struck in early February and stayed through March led to new records throughout the state. The Washington Post writes (LINK) that Great Falls bore the worst of it, with a record-setting streak of 32 days with the temperature below freezing. Did they check with the UNIPCCCCC before making that announcement? If we do indeed end up having a mini-ice age it will be interesting to see how the data manipulators manage to keep to their global warming hoax. They will have to keep adjusting historical temperature data to below zero even in the middle of summer just to keep to their fake story. Otherwise they will have to adjust them upwards and claim that CO2 emissions are causing dramatic global cooling over the past 100 years. I look forward to seeing a lot of their leaders behind bars for life in the not too distant future for committing the biggest fraud of all time. Fear not, this mighty cold snap will be homogenised away before the thaw sets in. Rather like the messages on the barn wall in Animal Farm! Two legs are better than four. Two legs are better than four……………………………. One more bit that I wrote last night but which didn’t make it into the post til just now. Hopeful? You’re 33 and you hope that the world will change energy sources, decarbonize and then cool, in time for you to have a baby? …and hoping that will give us the chance to change our minds. What minds will they change? It looks like they have none to change. But if they do change they should try to exchange what they have for a real one that works. Like I said above, this hurts only them. The rest of the world will ignore it except to laugh at them. What is so attractive about stupidity? They might check on that term in animal husbandry c.f.a. I thought you might have something about Andrew Robb and Landbridge … but the cupboard was bare. How would that go on the BOM blog? Brilliant Energy – which supplied gas and electricity to 17,000 households – has ceased trading, marking the latest casualty in the sector this winter. The business, based in Gosforth, had boasted of providing a “straightforward” service at a “fair and stable” price. Ofgem has said there is “room for improvement” in the licensing regime so businesses are properly vetted before they start competing for customers. New, tighter rules are expected to come into force next month…. Former Economy Energy customers are still waiting for refunds after the supplier went bust in January. It comes as Brilliant Energy became the 11th supplier to fold in 12 months on Monday. A month before Economy Energy went under, Money Mail helped angry readers to get their money back. The app, called Inconvenient Facts, is available only to Android users through the Google Play Store. Since March 4, users of Apple’s iPhone no longer can access the app through the tech giant’s App Store. Gregory Wrightstone, a geologist with more than three decades of experience, told The Daily Signal in an interview that he has his own opinion about what may have transpired inside Apple. 39min43sec to 43min47sec: Laura interviews Gregory Wrightstone, author of “Inconvenient Facts”: segment Debunking Biggest Climate Change Myths. CAGW protest was what ***generated interest from the audience? shouldn’t that be generated interest from the CAGW-infested Press in the room, ABC? However it was his comments on the upcoming global climate change protest, which is set for Friday, that ***generated interest from the audience. Mr Daley told the Press Club school children “don’t have a microphone” and “don’t have money like the big end of town”. “They do have a democratic right to assembly, they do have a right to protest,” Mr Daley said. Climate change and environmental issues have traditionally been viewed by voters as a federal issue, but Labor and Liberal polling shows it is well and truly on the state political agenda in New South Wales. When questioned by a journalist as to why he would advocate a “breach of the law” by encouraging students to skip school so close to an election, Mr Daley said “you have to shake the tree a little bit” — even if it drew criticism. “I think there is a great opportunity for young people on Friday to realise their own personal power,” he said. Mr Daley reiterated that if Labor is elected he will appoint the state’s first Minister for Climate Change to “to lead our state’s fight to protect the future of our children and their children”. CAGW-infested FakeNewsMSM has shown no such interest in the Brian Fisher report, which I believe was updated recently. every Coalition politician should have been campaigning on it relentlessly yet, instead, they started a fight over coal! 10min43sec to end: moves on to cost of electricity; Sloan: Labor says nice things like higher emissions target will lead to lower prices; another point in Brian Fisher report – in order to reduce emissions for transport, fuel excise tax would have to be increased by about 60 cents per litre – that will be popular too, won’t it? With a Federal election expected in May 2019, it is timely to assess the economic impacts of alternative domestic policy approaches proposed by the two major political parties. This paper uses the BAEconomics global model to assess the economic costs of various policy options. This work is ongoing and will be updated as policy options become more clear. Concurrently with his position at ABARE, in 1993 Brian was appointed one of the experts completing the socioeconomic assessment of climate change for the United Nation’s Intergovernmental Panel on Climate Change (IPCC) Second Assessment Report. He played an integral role in the international climate change negotiations as economic adviser to Australia’s negotiating team in the lead up to, and at, the third Conference of the Parties in Kyoto. At least it is honest about prices going up under either party but Labor will do the greater harm to the economy. With fewer people actually consuming electricity as more households and businesses make their own, the remaining consumers will be carrying an ever increasing burden of those price increases. Is it really Leadership when you don’t have a clue about the topic which is the basis of the protest. It looks more like cynical manipulation of vulnerable trusting children. Doncha’ realise, protesters for climate, that yr depriving the world of a throng of fuchure Social justice activists. Mao et Al would be sad. 140 people mostly women declared their decision not to have children because of climate change. Bet they are all horrers and doing mankind a favour! How stupid can you get ? Bring it on . . So their threat is that unless I give up my car, they won’t have children. Either they are excessively stupid or excessively narcissistic. Either way, seems like them not having children is a good option for me. We should ask them to have it in writing with a clause to say if they renege on their promise they go to prison for life. Would certainly be a strong case of child abuse if they did have children. If they hate using fossil fuel so much why don’t they go completely off grid with or without children and stop bothering us with their demands to do the same. Since when is using fossil fuels a crime? If anything people who force us to stop using fossil fuels are the ones committing a crime against humanity and as such should be treated appropriately. Anyone who believes children born today will have a lower standard of living than their parents, grandparents etc, is doing the public a massive service by voluntarily removing themselves from the gene pool. This happened in the 60′s through to the 80′s. The world’s average IQ went up a noticeable amount. So what went wrong after that? We are now living in the age of utterly stupid. Well, at least fewer men who wear scarves in summer will be breeding with fewer women who wear cheap, oversize ear-rings. These people are just as silly and/or evil as the people in the US pushing the Green New Deal. With people likes these inside a nation who needs enemies outside? It just proves that some parts of Darwin are accurate. And what aspects of Darwinian evolution are inaccurate, pray tell? Climate alarmist SJWs upholding a personal, self-imposed non-proliferation treaty? Sounds like a win-win situation to me. I’m not saying that increasing CO2 is the cause of climate change, but if it was, burning coal and other fossil fuels is not the problem. The problem is with all the appliances, technology and entertainment that we have now that we didn’t have 50 years ago, like air conditioners and computers, and the increasing population that uses them. As well, I don’t see anything from the warmists that they go without technology and entertainment to save CO2 from entering the atmosphere. I heard on a radio station a couple of days ago, that about 1000 tonnes of stuff has arrived in Melbourne by plane and ship for the Grand Prix. There’s a lot of CO2 going into the atmosphere just to get the equipment here, and the same to get it out again a few days later. Then there’s the CO2 emitted by the vehicles during the race. I expect a lot of the warmists, particularly politicians, (who probably get their costs paid by the taxpayer) would attend such an event. Or the taxpayer funded fireworks we see several times a year, $ millions, again a lot of gases going into the atmosphere. No one calls for them to be banned. My usual thought is that these people are just helping the gene pool, but I think these pronouncements are about as real as all the “celebrities” that said they would definitely emigrate of Trump won in 2016 (as if it was automatic that anyone would accept them). Not aware of one that did anything.